From the Hancock County Courthouse go east on Hwy 22 for 12.5 miles to Powelton. Turn left onto McGhee Rd (first dirt road on left). Go 1.5 miles to where Log Cabin Road forks into McGhee Rd. On the left at the forks is a house. 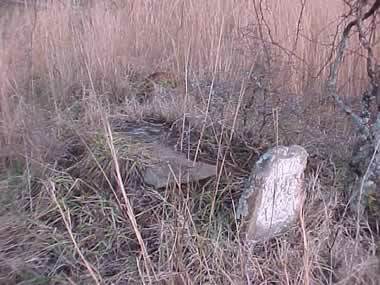 The grave is to the left of the house about 200 yards, keeping in line with the front of the house. A 34 M Abbreviation may stand for Age 34 months, but unclear.